AutoChart v. Insight Genesis v. Sonar Chart v. ???? I have a unique problem and I'm hoping you guys can help me select a GPS/Fishfinder to meet my needs. I live on the Little Manatee River in FL. It is navigable, but has numerous unmarked shallow water areas. I'm looking for either a) a GPS/FishFinder combo with incredibly accurate maps (<5m) that identifies depth along the river, or b) a GPS/FishFinder that allows me to chart the river automatically/manually using DI/Sonar, update the charts, etc. or use other boater's scans, charts, etc. off the internet. Humminbird's AutoChart/AutoChart Live looks interesting, but I'm unable to review the fidelity of existing charts. Plus, it keeps referring to it being used for Lakes (LakeMaster? ), so I'm not sure of it's applicability to coastal rivers, Tampa Bay, etc. Does the AutoChart software even work with Windows 8? Then there's Lowrance/Insight Genesis. I was able to create a free account and see that the LMR was already scanned/posted (excellent!) and I like that they handle the processing (no software to load). But, I'm reading the Elite-7 crashes/is slow to load and I don't feel like spending $1k for a newer/more powerful model. Anyway, I appreciate any advice you guys can give. I'll try to stay somewhat unbias here and give you some facts. Garmin: no such item exisits unless you record the logs and upload to Navionics and then update your Navionics mobile app. you can then see the new data contours and use that. We had a chart for Garmin but they decided to block it rather than sell more plotters. Lowrance: The hDS Gen 3 you can use the GoFree and connect wirelessly to the Navionics app and draw live contours as you go which improves the map and gives new detail. Once you reopen the app after disconnecting the logs go to processing and in about a week you can update your chart and get the new contours on the plotter. Elite: Elite will only do the Genesis model (more on that in a moment). Vexilar: is a wifi ducer that costs about $149. You connect to your phone and can draw live contours with SonarChart Live and then update mobile device. Raymarine also makes one now called the wifish that wil lalso connect wirelessly to the app and draw live contours for $199. Humminbird: lets you record to a blank chart, upload to Navionics, we then process and turn those logs into one foot contours when you update your chart. Autocharts you get 8 hours for free (I think) then you have to buy the card for $99. This will create the live contour snake at 3 foot contours. You must do a grid pattern for it to work well. You must stay no more than 10 mph. Genesis: You can do for free or get a paid version for some more detail but either way Navico owns your logs. if you upgrade to the paid feature there is some additional features you get like vegetation. On this you must run a grid pattern, no more than 10 mph, no data seen until you upload. Once you upload you will see it rather quickly as the contour snake on your computer. You then save to an SD card and move to your plotter. The snake then transfers to the plotter on your map. SonarChart Live: You get free with a Navionics App and either Go Free, Vexilar, NMEA digital yacht or Raymarine. You must do a grid pattern, you can go at any speed you desire as long as you hold bottom, contours draw live and you can see them change and adjust if needed since doing it live. Once you close the app it gets processed and then turns into SonarChart which is where Navionics takes the snake out of it and corrects it into the land contours (and adjusts the land if needed). You then update your chart and get the info. SonarChart: you record to a blank chart on Humminbird, Raymarine (on a Navionics card directly), or some older Lowrance units (not Elite). Here you run as fast as you hold bottom. 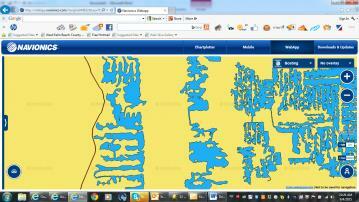 You can do a grid pattern to map heavily or you just "go boating". this means just record each time you go out. by nature of boating over amonth you'll have close to a grid pattern. Or if you have friends in other boats they can do the same and now over a week 5 boats will really have it mapped. Then upload the logs to Navionics and update your chart a week later and new data. have I lost you yet? Giving a lot of data as I will save the link to this thread to use other times. popular question. for you with an Elite.... personally I find doing a grid with no data showing and later finding a missed spot boring. I'd suggest looking into a Vexilar or the Raymarine Wifish. Run the SonarCharts Live (which is actually fun) and record on the app. 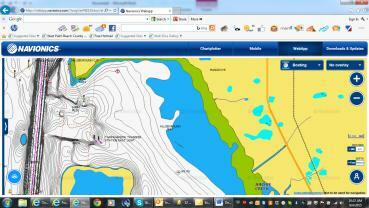 About a week later update your Navionics chart in the plotter and you'll have the new data. 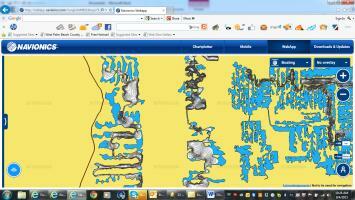 Navionics does have some data on the river you mention. 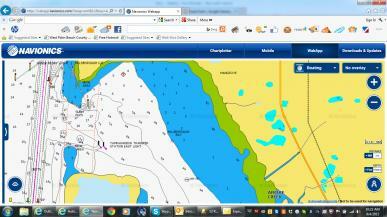 Check out the web app http://webapp.navionics.com/?lang=en#@8&key=s%7C%60cD~_dsN this will be a good viewer for you. click the bottom left sonar icon to see the SonarChart. and now im going to ice my fingers from typing. Hope this helps. Sharky, great info. Thanks. I'm also a newbie to this mapping and fish almost exclusively on central Florida lakes with an occasional trip to Pine Island sound. The lake I live on ( Crooked - Polk County ) has horrible maps on all of the lake cards I had found, therefor mapping is a must. I had just about pulled the trigger on buying a GO5 XSE and using my ipad to mirror it to a larger screen that I could relocate from console to front of boat as needed. The paid Insight Genesis program looked a little better to me than quickdraw simply because a lot of the lakes in this area have already been mapped by others. If I understand your info above correctly, there is also an less expensive option of buying the WiFish unit from Raymarine and teaming it with my ipad for mapping and live sonar. I guess my questions are how does the Insight Genesis program compare to SonarLive with regards to freshwater mapping? Can I use a WiFish unit and tablet without buying a Dragonfly? Are there any advantages to buying a Dragonfly instead of a WiFish? Thanks. You can buy the WiFish unit without having to buy any plotter at all, it basically turns your ipad into your plotter. So, you won't have to buy a Dragonfly or any other plotter. I think you will find that the SonarLive will be easier, update quicker and be more correct when it has updated than anything else out there. That's been my experience, at least. And with the WiFish only, you should be more flexible with where you can take it and do the mapping as it won't be connected to a 22-foot boat that might not be able to reach the small lake you're trying to learn more about. Thanks. I think I'm going to get both a wifish and a small dragonfly pro and compare the 2 using my ipads. Sounds great! Let me know what you find out. I'm curious as to what you come up with.